The industry has decided that pure AC ("driverless") LEDs are not the best idea. But new AC driver architectures, the most recent of which eliminates transformers, are on the way. We have talked about the seemingly obvious idea of driving LEDs by placing antiparallel strings of them across mains alternating current. At first glance it looks attractive to do away with all that BOM-intensive electronics in the modern LED driver. This idea was first explored a couple of years ago by Seoul Semiconductor with its Acrich line, and by Lynk Labs with the Tesla LED. We have explored some of the lesser players as well. Ron Lenk has suggested how the design of LEDs themselves could be modified to make AC operation more efficient and flicker-free. Both Seoul and Lynk, in more recent products, are moving away from pure AC LEDs and toward packages of more standard DC LEDs with some form of AC driver. Seoul's Acrich2 fits this description (and the company is even partially unbundling its AC driver technology); so does Lynk's SnapBrite, as DesigningWithLEDs.com mentioned. LEDs Magazine's Maury Wright first pointed out this trend last April, when we began to see not drivers for AC LEDs, but rather AC drivers for LEDs. A month ago DMB announced an AC driver IC. Now Texas Instruments, manufacturer of popular switched-mode power supplies (SMPS) for LEDs, has introduced a form of AC driver that does away with transformers entirely, reducing the parts count and simplifying driver design. 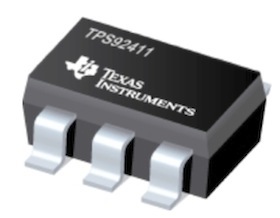 The TPS92411 is an IC that the company characterizes as a "floating switch for offline AC linear direct drive of LEDs with low ripple current." It replaces the buck, boost, or flyback AC/DC LED drivers most commonly used today. Also on offer are an evaluation board and design calculators, in the form of Excel spreadsheets, for 120V and 240V operation. Both LEDs Magazine and DesigningWithLEDs.com have lucid explanations of the TPS92411's theory of operation, so I won't attempt to elaborate the technicalities here; follow either one of those links for the details. TI has priced the TPS92411 at 23¢ in 1,000 quantities.